I must confess I’m a lucky man. I do a job that I love and this same job allows me to meet extraordinary people. Adrien Friggeri is one of them. He’s a PhD candidate, working on social network analysis. He’s been doing a few experiments using the social graph provided by Facebook and his latest one is called “Who did I forget“. 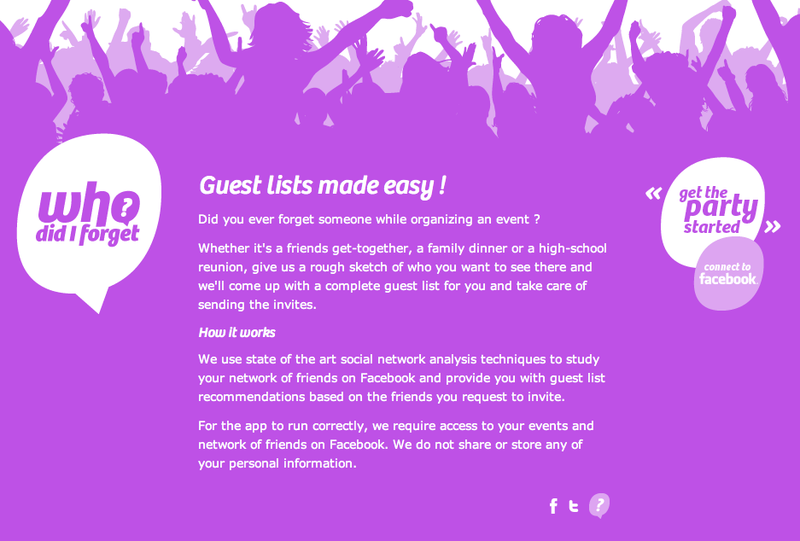 The idea behind Who did I forget is pretty simple : add a few names and the app will suggest a complete guest list for your next event, ready to be invited. The science behind the app is nevertheless, powerful. It instantly analyzes your Facebook social graph and rank relationships between every individuals to group them by affinity. The algorithm Adrien and the INRIA lab has developed gives impressive results : type just one name and you’ll get a complete list of people who are friends with each other, with a close to perfect accuracy. Create your guest list now on WhoDidIForget.com. Learn more about the science behind the app here.